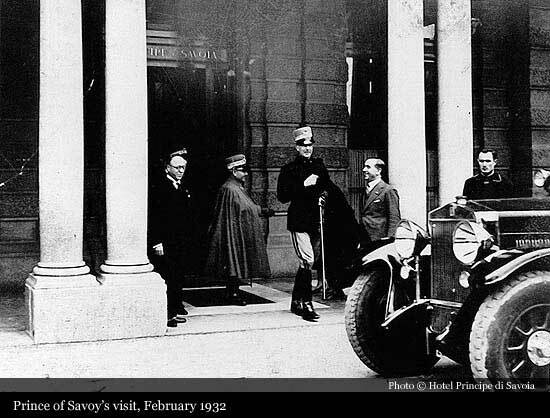 In 1927, the year the Principe opened its doors as the Principe e Savoia, Milan had already begun building its reputation as Italy’s business centre. So the hotel’s location in what was then a nondescript plaza called Piazza Fiume, far north of what was considered the heart of Milan, was less illogical than it first appeared. Although staunch traditionalists among the Milanese believed that everything that really mattered in the city had to be located between Piazza del Duomo and Piazza della Scala, the fact that the plaza -- then as now -- overlooked the 19th-century style façade of the city’s central railway station, Stazione Centrale, made it logistically convenient for the burgeoning business tycoons of the era. 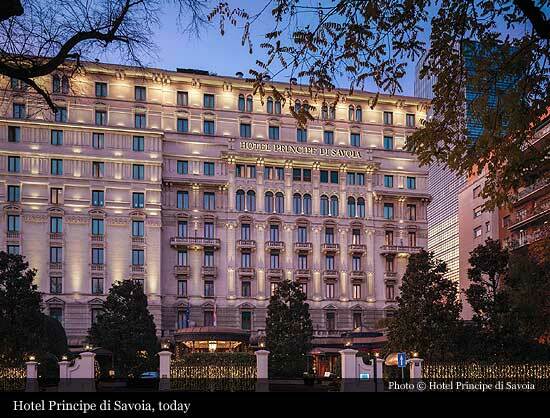 The Principe e Savoia was developed by a limited company called “S.A. Acquisto ed Esercizio Alberghi Savoia”. The company entrusted the design of their project to Cesare Tenca, a prominent Milanese architect. The site was chosen on well-reasoned grounds: It stood in a fairly open space amidst trees, it was close to the railway station, the city centre could be reached both easily and quickly and La Scala (the world’s most famous opera house and Milan's leading social attraction), where Arturo Toscanini conducted until 1928, was less than ten minutes away by carriage. Nevertheless, the proximity of Milan’s industrial area was determinant in its success, as the hotel was originally intended, above all, for businessmen. This photograph from the hotel’s archives, shows the Principe di Savoia, still freshly painted, fronted by tramlines forming a roundabout on their way back to the then-city centre. Factory chimneys can be seen rising in the background. Two vaguely warlike-looking buildings denote the presence of customs toll-houses marking the old boundaries of the city. Proof of the hotel’s intended clientele can be deduced from the advertising decisions made for its opening on April 6, 1927. Although all the local newspapers carried the information, only one daily carried a full-page advertisement. This paper was Il Sole, a business publication -- then as now -- read for its coverage of stock market and raw material prices, wholesale and retail price trends. This decision was akin to choosing The Wall Street Journal or the Financial Times to carry a hotel ad today, rather than The New York Times or the Times of London. The text of that first ad is also revealing. Although the name of the architect, Cesare Tenca, is mentioned, significant space is dedicated to a meticulous listing of room prices, suggesting that the target customer is someone attentive to making financial decisions based on value for money. Mention of the featured “direct dial phone in every room”, is geared to the appeal of practical business calls rather than leisurely social conversations. 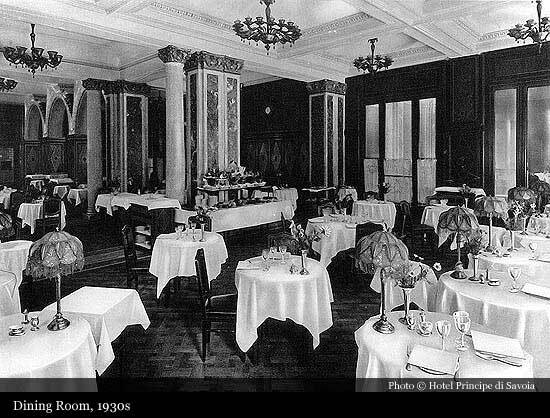 The ad also mentions that an orchestra was to play classical music for dinner every evening from 8 till 11 o’clock. This offering was intended to enhance the prestige and social standing of the hotel’s clients who might wish to invite guests to dinner to work out the final details of a contract nearly ready for signing. From the outset, the hotel’s success exceeded all expectations. The first guests were international business people and powerbrokers. 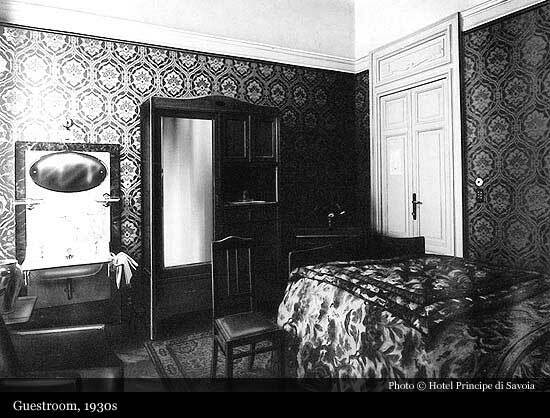 But soon, attracted by the novelty of the hotel, by the lure of a quiet stay in the midst of the trees and gardens surrounding the building, by “all the comforts one could possibly think of” (as the opening-day advertisement promised), other guests arrived: kings, queens, international royalty, and world-renowned artists and intellectuals. They quickly realised that La Scala was less than ten minutes away by carriage. 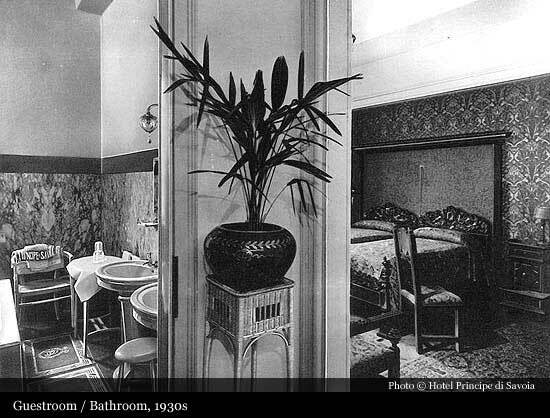 Legend also has it that among the guests of the new Milanese hotel was Italy’s dashing literary icon, Gabriele d’Annunzio. 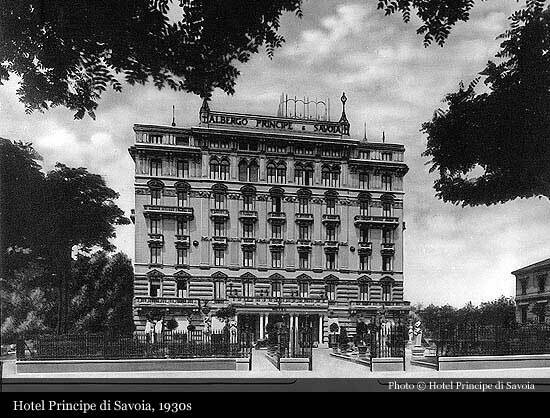 And in the years both before and after World War II the “Principe & Savoia” registered the names of guests more associated with the world of society and letters than with business: the Duke of Windsor and Erich Maria Remarque, Charlie Chaplin and Josephine Baker, Evita Peron and Maria Callas. The Aga Khan and Aristotle Onassis were also regulars. 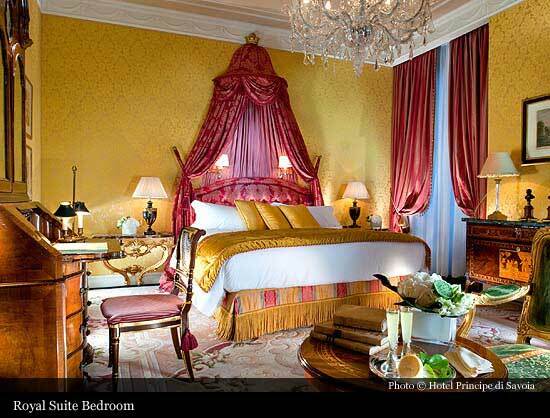 Thus the fame of the hotel spread through the quality of the guests who patronized it. 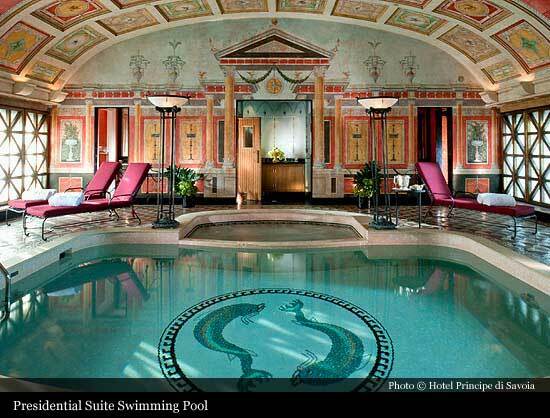 In more recent times, an American magazine, well qualified in matters of tourism commented: “The Principe di Savoia is a kind of private club both for the aristocracy of money and for that of great names. 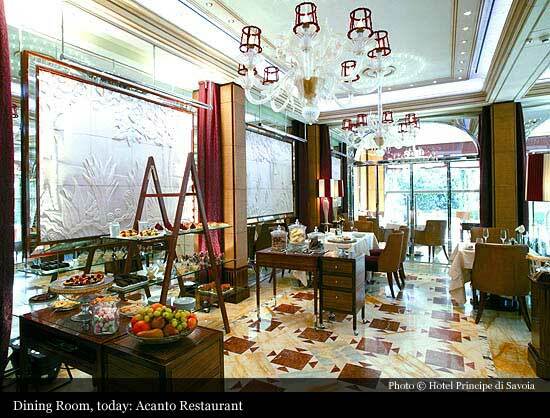 If you want to catch a glimpse of Gianni Agnelli and his wife, Marella, together with Henry Ford and David Rockefeller, or Elizabeth Taylor, Rudolf Nureyev, the Prince of Monaco and the Visconti di Modrone all having an aperitif together, just pop into the bar at the Principe di Savoia in Milan”. The Great Depression of the 1930s was a difficult time for many businesses, including the S.A. Acquisto ed Esercizio Alberghi Savoia. In 1938, the company was incorporated into the Ciga Hotels group. This signalled the start of a greater international prominence for the Principe and marked a shift in direction for Ciga, whose well-known properties included the Danieli and Gritti Palace in Venice. 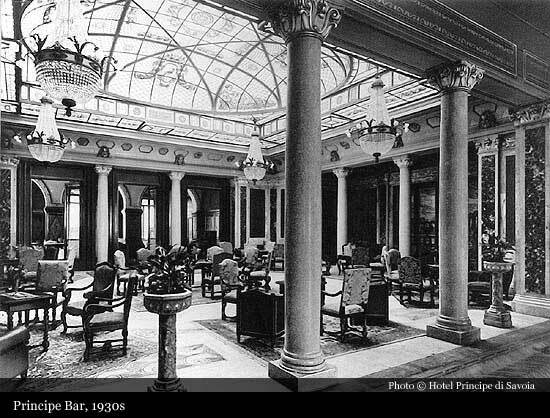 Such hotels catered to upscale vacationers, not business folk, so the decision to acquire the Principe had a revolutionary air about it: the divorcing of the idea of hospitality from that of leisure, the prospect of operating in a city where the word ‘holiday’ seemed completely out of place. The military and political upheaval of World War II took an even greater toll on Milan and its economy than the economic upheaval of the Depression. The Principe became a headquarters for the Germans and later for the Americans. By the time the smoke cleared in post-war Italy, Milan’s geography had changed markedly. What had been the suburbs of the city was now part of the centre. Wide new streets had been laid out, and the factory chimneys of the early photo were no more. Factories had begun migrating to the suburbs and beyond. The Central Train Station, damaged during the war, had been rebuilt on what is its current site north of Piazza della Repubblica. After 1950, the Principe, not seriously damaged by wartime events, was also renovated and enlarged. Two new wings, called Principe Rosso and Metallico, were opened between 1956 and 1957. 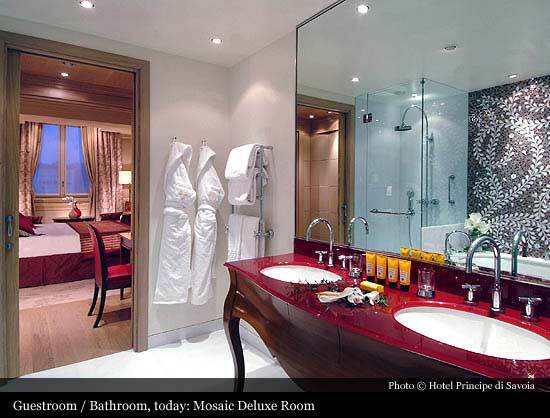 When this renovation was complete, the management of the hotel was taken over by Ciga Hotels. 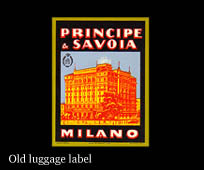 They decided to rename the hotel the Principe di Savoia in the 1980s. This change was prompted by the fact that Principe di Savoia is the correct way to refer to the Italian royal family, rather than Principe & Savoia. 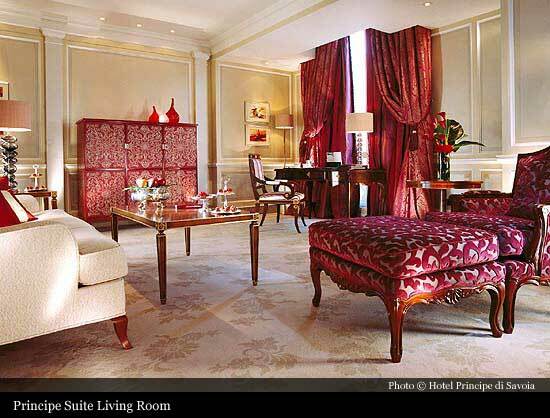 A change of greater underlying significance occurred in 2003 when the Dorchester Collection, a company entirely controlled by the Brunei Investment Agency, took over the Principe. The new owners have embarked on a program to ensure that Milan’s leading hotel maintain its position, a commitment that will be seen in everything from interior design to remodelling of rooms and meeting areas, and a large number of suites, a sophisticated spa and gym with swimming pool, a fully-equipped business centre, Michelin-starred chef in the restaurant, and the most avant-garde technology such as WI-FI and interactive television. 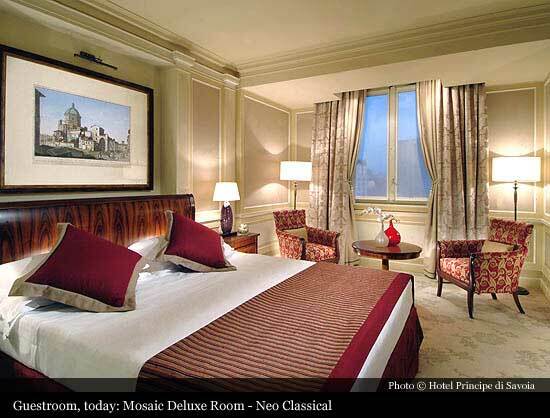 All is clothed in classic Liberty style, which evokes the hotel’s original character. Service is of course paramount and the hotel staff come from the finest schools, receive careful training, have experience dealing with a demanding clientele, and often also have experience abroad. These high standards of service and style are appropriate to a city that is the financial, fashion, media and design capital of Italy. Milan is both the southernmost of European financial capitals and the most northern of the great Mediterranean cities. 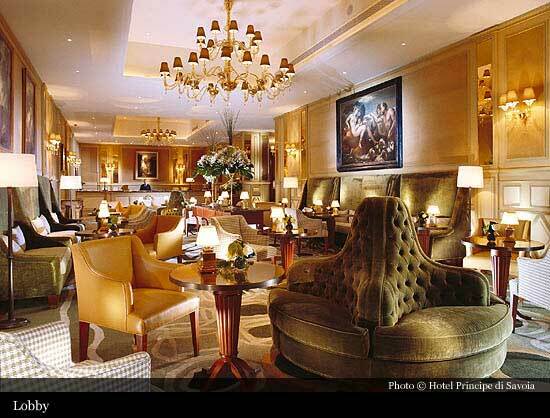 Milan is also an international centre for conferences, congresses, scientific meetings, fashion events and social happenings, events in which the hotel plays a highly visible role. 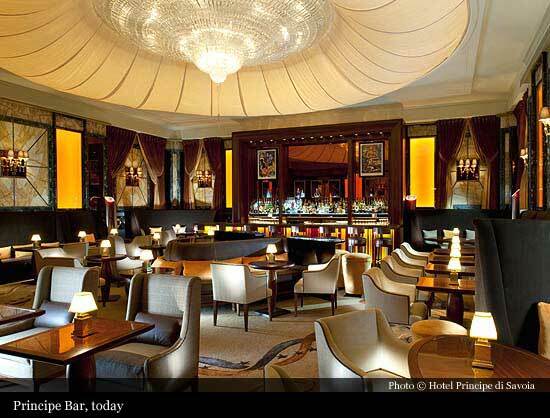 Today the Principe di Savoia continues the tradition it has culled since its founding -- a place where the international elite of business and leisure meet in an atmosphere of cutting-edge class and sophisticated style.